When you connect to your meeting, you hear a distracting echo, either when you speak or the other person speaks. The echo is likely caused by sound coming out of a speaker or speakers and being picked up by a microphone or microphones, being routed back through the system. e.g., If you can hear your own voice, then the sound is coming out of your participant's speakers and are being picked up by their microphone--this is why you can hear yourself again. These instructions are intended for the source of the echo (i.e., the person that does not hear themselves). If you are on a Windows computer, it may help to change your audio echo cancellation method. Since Windows computers have much more variable hardware than Mac computers, we have 2 different methods to try to capture as many of those variations as possible. If the default doesn't work for you, you can try the alternate. 1. Hover your mouse over your own video tile, so that a panel appears at the bottom. 2. Click on the gear icon, and select Audio and Camera Setup... from the drop-down menu. 3. From the menu that appears, click on the Advanced link in the Microphone section, in the upper left-hand corner. 4. 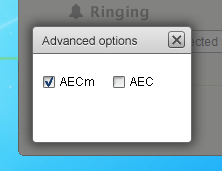 Select the checkbox that is not currently selected, to see if the secondary AEC method works better for your equipment. Then click on the X to close the box, and Done to exit the Audio and Camera Setup window. If you are on a Mac computer, it may help to decrease your microphone volume so that it is less sensitive to your speaker output. 1. Click on the Apple icon in the upper left hand corner and select "System Preferences...". Then click on the "Sound" icon on the right-hand side. 2. 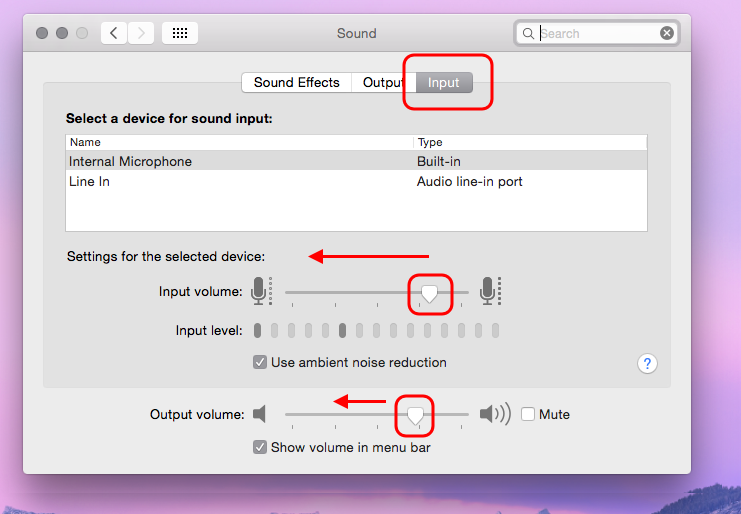 Select the device(s) you would like to affect (on a Mac, usually the built-in microphone or speaker) and decrease the microphone and/or speaker volume. Echoes are caused by sound coming out of your speakers and going back into your mic--this is how the other person hears themselves. The best way to prevent this is by using a headset or earbuds, so that the other person's voice goes straight to your ears without being picked up by your mic, or to use an external microphone that is made for conferencing. See our support article on headset and external microphone recommendations. This article was last reviewed by our Support team on October 21, 2015.